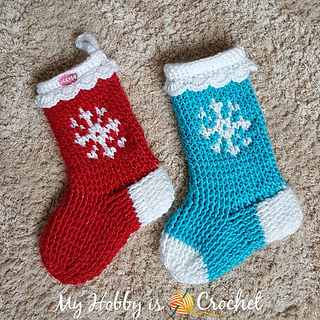 Beautiful Christmas Stockings with a nice snowflake detail! These stockings would make great chunky & warm slipper boots as well! They could fit a child, but an adult women also, if you’ll add more rounds for the length. 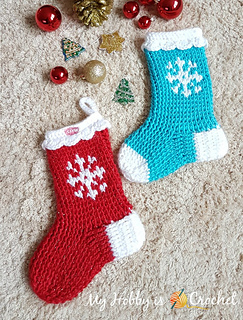 Subscribe to my FREE Newsletter to stay updated with new free crochet patterns, tutorials and other yarnie things! Follow my FB Page Myhobbyiscrochet for daily free crochet pattern links! 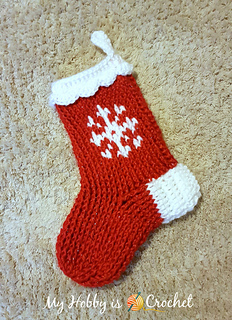 Share your projects and get advice in our Facebook Group My Hobby is Crochet!